Firefly is one of those cabins that says “Hey yawl Come On In” As you drive up the drive through the stunning landscape you’ll feel your cares melt away to Peace, Quiet and Relaxation. No doubt you made the right choice. The home very spacious with three bedrooms, two bathrooms, open concept living, dining, kitchen with a rock, gas log fireplace, large leather sofa, dining table seats 6 and beautiful decor. Nestled in the woods but still just minutes from downtown Blue Ridge, GA for a perfect vacation spot. The home offers 1 king in master on main floor, 1 Queen Bed , a Day Bed with trundle and a Queen Sleeper Sofa to sleep 8 comfortably. Enjoy a relaxing dip in your private Hot Tub on a screened porch or relax in the rocking chairs on the front porch while watching nature. Beautiful forest view and secluded with peace and quiet, that’s Firefly. Grill burgers or steaks on your gas grill and enjoy your evening at home. All the amenities of home with a fully equipped kitchen, washer/dryer, dishwasher, WiFi and cable TV. Bring your fur baby and stay awhile. This a GREAT location for those who want to visit the local antique shops and events happening in the area. The outdoor activities are endless in the north Georgia mountains where Hiking, Kayaking, Tubing, White Water Rafting, Paddle Boarding, Boating, Horseback Riding, and Zip-lining are all right at your fingertips. 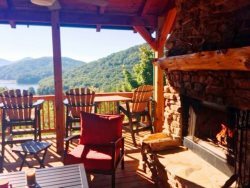 You can also visit a Waterfalls, Hike to a Swinging Bridge, or take a more relaxed approach and enjoy a great meal at one of the many wonderful restaurants or breweries located in downtown Blue Ridge. Don’t forget to take a ride on the Blue Ridge Scenic Railway, be entertained at the Big Foot Museum or step back in time at the local Swan Drive-in Theater. There is something for everyone in the mountains! "We stayed at Firefly over Presidents weekend. The cabin was great- had everything we needed and was very clean!" We had an awesome stay. The cabin is very cozy, gas fireplace was very convenient. It was kind of hard to squeeze everyone in, I wouldnt say it sleeps 8 super comfortably but its fine for 5-6 without squeezing in. Very nice!! Easy access and close to town!!! We found everything easy to use. From the TV, fireplace, hot tub. We appreciate the book of directions. Our cabin was absolutely perfect! I recommend going directly through the rental agency instead of flipkey. We had a issue working through flkey and Mountain Laurel worked with us until they found what we were looking for.